Back in the Garden, again. . . I am tired, achy, and sneezing my head off. I have a little bit of a sunburn and sore muscles everywhere. But I’m so happy to be outside working in my garden. I’m not kidding when I say that up until June 1, not a week went by without hail or snow. I woke up on May 24th to about 4 inches of snow on my poor tomatoes that were hardening off on the back deck. Those of you in Utah know what I’m talking about! But only those who live in Lehi seem to enjoy the generous amounts of hail and gusting winds that I do. 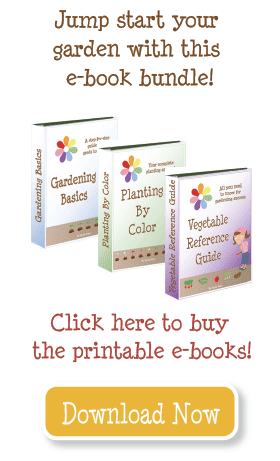 My gardens were a sore sight–I hadn’t put out my irrigation lines. Once I took a good look and tested them, each section was broken or malfunctioning in some way. I was slightly depressed, but even more determined! So I snaked the drip irrigation lines in between onions, spinach, and cilantro that was already growing. After putting together my new easy garden box, I did a quick inventory of what I had, what I needed, and set off to my happy place (BJ’s plumbing in American Fork). The guys that work there are always so kind and helpful, and I don’t feel like they look at me like I’m an idiot, just because I’m a girl. On my birthday and in the blazing heat I repaired, set up, and souped up my irrigation. Within a few days I had my tomatoes transplanted and all my other seeds in the earth!!! In my east garden beds I replaced PVC (which will break after just a few years in the sun) with black irrigation tubing. It was a quick, easy, and inexpensive fix! Here I have 4 tomato plants, 2 determinate (Roma) and 2 indeterminate (Celebrity, Better Boy, Early Girl, or Salad tomatoes). Honestly, some of the labels got switched around by little “helpers” at my house. So it will be a bit of a surprise to see what grows where! In the south bed I planted a Sweet 100 cherry tomato plant, and will put up a vertical trellis and keep it pruned. The other 12 squares will have peppers (8 bell, 4 hot). 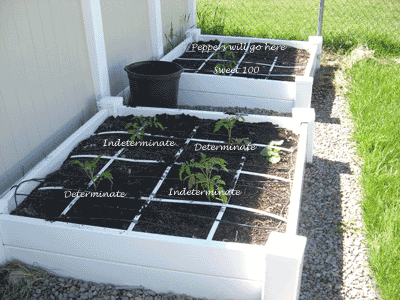 In the middle box I will use the tomato cages I built this year–short for the determinate, and tall for the indeterminate. 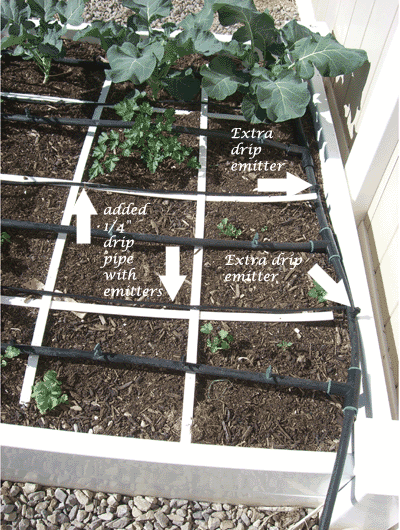 In my west gardens I replaced an L joint in one corner, added 1/4″ drip irrigation tubing with built-in emitters between my big irrigation lines, and added extra drip emitters to the outside lines. At the top of this picture you can see my broccoli plants, growing well, my parsley, and several patches of volunteer cilantro. I let the cilantro go to seed last year, and apparently when I added compost and mixed up the soil I spread cilantro all throughout this garden. My husband will be happy–he loves cilantro. 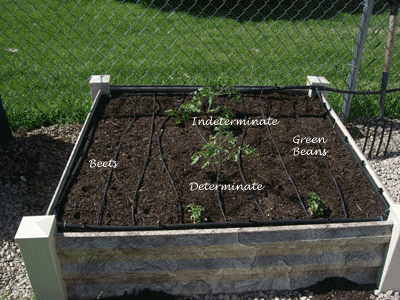 I planted cucumbers, beans, dill, and basil in this garden bed. I replanted carrots and lettuce in spots where none germinated. I’m excited to expand my garden with a new 4×4 bed this year! I was able to extend my current irrigation to tie into this one, and hardly needed any parts! On the top right corner is a T, then L’s in all the other corners, connected with irrigation tubing. I put 1 gpm (gallon per minute) emitters all around the outside. Then I used 1/4″ tubing with built in emitters for the rest. I am thinking that this is my favorite irrigation setup. It should cover the edges, and water evenly. I didn’t have a plan for this garden bed, because I installed it last-minute. Since I had some extra tomato plants, I put those in the middle. 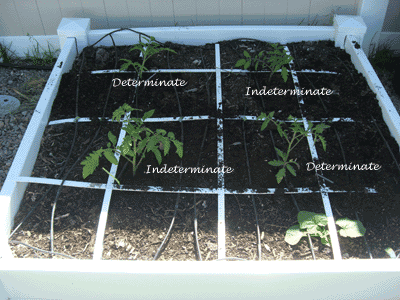 I’ll use one short and one tall tomato cage for those. On the right I planted a row of green beans (3 varieties) and on the left a row of beets. Just for fun I threw in some oregano, and planted some mother’s day flowers I got at church. It may seem like a lot, but now that I’m “back in the garden again” I can just do a little every day and soon enough I’ll come to the end of my list! I’ve just finished a short video on pruning tomatoes, watch for it on Wednesday. The only plants I’ve ever pruned are tomatoes–they grow hog wild and you either need really good support, or to prune them. Another reader pointed to a video where the guy prunes his zucchini. I am trying it, and will take pictures and report on how it goes. It has emitters every 6 inches. I find this waters pretty evenly. What is the spacing of your built in emmitter tubing? I’m using drip tape right now and am not too happy with it. Thanks for a great blog!!! Thanks! Your blog is helpful! This is my first year with a square foot garden, and so far, I love it! Thanks very much for inviting me to guest post on your blog. I would enjoy doing that very much. Feel free to email me with the details, I’m looking forward to hearing from you. Also, congrats on getting your gardens in, and Happy Birthday to you! What does that look like? Do you have a picture you can send me? 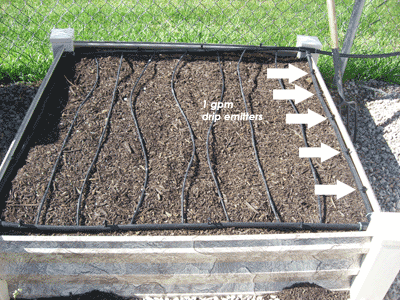 Hey, one thing I’ve been doing with my drip line in the boxes is I put in a microsprinkler for each box. That helps with my seed germination because the dripline doesn’t get the surface wet very well. Just a tip.